into the southern celestial hemisphere. Today day and night are of equal length. Today rat haus reality completes its 20th revolution around the Sun and begins its 21st cycle. Gratitude abounds having this ratical venue from which to publish materials worthy of note and emphasis. In this past circle of the Sun I am re-connecting with two primary interests that have compelled my attention on the journey: the critical necessity of mending the sacred hoop created by our collective indigenous ancestors and the consequences of playing with the mountains of poison fire generated from man-made radioactive matter. I, David Ratcliffe, cannot help but feel grateful for John Gofman’s decades of unpaid work in the service of protecting health for you and for future generations. Regarding exposure to ionizing radiation, Dr. Gofman reluctantly became a very prominent whistleblower from 1969 to 2002, with the ethical choices and dangers and emotional ups and downs which go with whistleblower territory. —Daniel Steinberg, “The Pathogenesis of Atherosclerosis. Sierra Club Books, 1981, p.8. There is no risk-free dose of or exposure to radiation. It is not humanly possible to achieve 100% containment of these man-made radioactive particles that burn at the atomic level. Many people think nuclear power is so complicated it requires discussion at a high level of technicality. That’s pure nonsense. Because the issue is simple and straightforward. There are only two things about nuclear power that you need to know. One, why do you want nuclear power? So you can boil water. That’s all it does. It boils water. And any way of boiling water will give you steam to turn turbines. That’s the useful part. The other thing to know is, it creates a mountain of radioactivity, and I mean a mountain: astronomical quantities of strontium-90 and cesium-137 and plutonium—toxic substances that will last—strontium-90 and cesium for 300 to 600 years, plutonium for 250,000 to 500,000 years—and still be deadly toxic. And the whole thing about nuclear power is this simple: can you or can’t you keep it all contained? If you can’t, then you’re creating a human disaster. So I find nuclear power this simple: do you believe they’re going to do the miracle of containment that they predict? The answer is they’re not going to accomplish it. It’s outside the realm of human prospects. You don’t need to discuss each valve and each transportation cask and each burial site. The point is, if you lose a little bit of it—a terribly little bit of it—you’re going to contaminate the earth, and people are going to suffer for thousands of generations. You have two choices: either you believe that engineers are going to achieve a perfection that’s never been achieved, and you go ahead; or you believe with common sense that such a containment is never going to be achieved, and you give it up. Fukushima is the latest instance of mountains of deadly toxic radioactivity released into the biosphere that humans are incapable of containing. In addition to the astronomical releases of radioactive isotopes from such calamities there are also the medical and public health consequences of the entire nuclear fuel cycle: from the mining and enrichment of uranium, its transport, operations in nuclear reactors and routine standard operating procedures that release radioactive isotopes in both gaseous and liquid forms, as well as reprocessing of so-called spent fuel, disposal of radioactive trash, and the proliferation of fissile materials employed to produce nuclear weapons. To appreciate the magnitude we are dealing with concerning man-made radioactive pollution, it is essential to learn about a whistleblower who made significant contributions towards ushering in the nuclear age and then devoted himself for over 30 years to point out the dangers of further nuclear contamination to present and future generations. I thought, probably all kinds of biochemical problems in medicine are going to be solved by the application of radioactive tracers. [3nw] How better could I prepare myself for a future medical career than to work on a problem involving artificial radioactivity? So I started to work on trying to find out if uranium-233 was fissionable, and I proved that it was, using what’s called both slow- and fast- moving neutrons. In fact, I proved that it was even better in many respects than plutonium for this purpose. [4nw] All that was connected with my Ph.D. thesis which I finished in 1942. When I finished the work on 233U, I became the fourth chemist in the world to work with plutonium.... The guy who really did the only chemistry that was worth talking about before I got in was Arthur Wahl. He was a graduate student one year ahead of me. He knew everything in the world there was to be known about plutonium, and he taught me. And I got started at the same time. In order to make a bomb out of plutonium, we had to learn a hell of a lot of chemistry of plutonium, at a time when practically no plutonium was available. We had never even seen it. We were tracing its radioactivity around by its alpha radioactivity. But we learned quite a bit about the chemistry of plutonium in the year that followed. Dr. Robert Oppenheimer was a nuclear physicist involved in the Manhattan Project and headed the Los Alamos Laboratory to build and test the first atomic bomb. In the fall of 1943 he came to see John Gofman with an urgent need. I remember when J. Robert Oppenheimer came back from Los Alamos and came to see me and said he absolutely needed a miligram of plutonium in a hurry. At that time the total world stock was about a tenth of a miligram—yet a year later we were going to have grams of it—and asked if we would prepare it. And we agreed to do it. So we bombarded a ton uranium nitrate on the Berkeley Cyclotron night and day for two months and then we set up a little chemical factory in Gilman Hall in the chemistry department on the campus and we worked night and day around the clock to separate that plutonium out of that ton of uranium and deliver it to Dr. Oppenheimer and Dr. Kennedy: one point two miligrams of plutonium. So it was the world’s largest factor of increase in plutonium production at that moment. The world’s first miligram. I don’t know whether I’m proud of that or sad about it now. So I was the first chemist in the world to isolate milligram quantities of plutonium ... We knew nothing of its biological problems. I got a good radiation dose in doing that work. I feel that since that time, with each year that’s passed, I consider myself among the lucky, because some of the people who worked closely with me in the Lawrence Radiation Lab died quite prematurely of leukemia and cancer. I’m still at a very high risk, compared to other people because of the dose I got. I probably got a hundred, hundred and fifty rems in all my work. That’s a lot of radiation. And damn stupid, but nobody was thinking about biology and medicine at that point. We were thinking of the war. So we did it. John Gofman received his Ph.D. from UC Berkeley in 1943 in Nuclear/Physical Chemistry. His Dissertation was titled, “The discovery of Pa-232, U-232, Pa-233, and U-233. The slow and fast neutron fissionability of U-233.” As a result of his work on the Plutonium Project Dr. Gofman co-discovered protactinium-232, uranium-232, protactinium-233, and uranium-233. With Robert E. Connick and Arthur C. Wahl, he shares patent #2,671,251 on The sodium uranyl acetate process for the separation of plutonium in irradiated fuel from uranium and fission products. With Robert E. Connick and George C. Pimentel, he shares patent #2,912,302 on The columbium oxide process for the separation of plutonium in irradiated fuel from uranium and fission products. And with Glenn Seaborg and Raymond Stoughton he shares patent #3,123,535 on The slow and fast neutron fissionability of uranium-233, with its application to production of nuclear power or nuclear weapons. The work conducted with Glenn Seaborg, for separating plutonium from uranium and other fission products of irradiated nuclear fuel, was the precursor to full-scale plutonium production at the Hanford Nuclear Site in Washington. The plutonium that was separated and produced at Hanford using the techniques Gofman helped develop was used to make the Nagasaki atom bomb. began his research on coronary heart disease and, by developing special flotation ultracentrifugal techniques, he and his colleagues demonstrated the existence of diverse low-density lipoproteins (LDL) and high-density lipoproteins (HDL). Their work on lipoprotein chemistry and health consequences included the first prospective studies demonstrating that high LDL levels represent a risk-factor for coronary heart disease and that low HDL levels represent a risk-factor for coronary heart disease. His principal book on the heart disease research is Coronary Heart Disease (Springfield, Ill: Charles C. Thomas, 1959). From 1947 to 1951 Dr. Gofman was a physician in radioisotope therapy at the UCB Donner Clinic. During these years through his research he became more and more engaged in studying heart disease, lipoproteins, and how the blood transports cholesterol. Through the ensuing decades there followed acknowledgements from the medical establishment of the significant contributions made by Dr. Gofman to the field of heart disease. 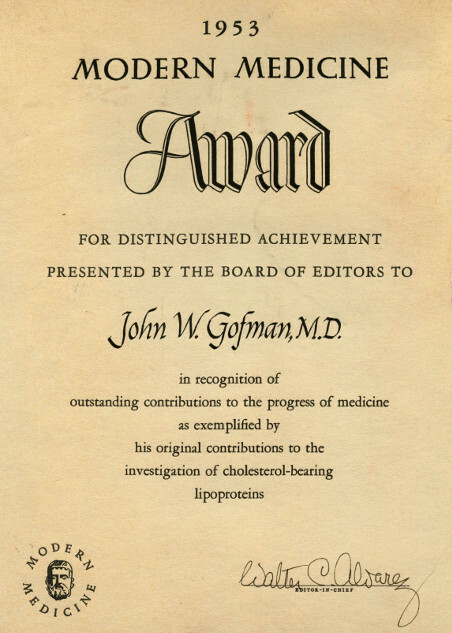 1954: received the Modern Medicine Award “for distinguished achievement ... in recognition of outstanding contributions to the progress of medicine as exemplified by his original contributions to the investigation of cholesterol-bearing lipoproteins”. 1965: received the Lyman Duff Lectureship Award of the American Heart Association, for his research in atherosclerosis and Coronary Heart Disease. 1974: the American College of Cardiology selected Dr. Gofman as one of twenty-five leading researchers in cardiology of the past quarter-century to participate in the documentary titled, "An Oral History of Twenty-Five Years of American Cardiology: 1949 - 1974". 2004: the Journal of Lipid Research, Volume 45, “Thematic review series: The Pathogenesis of Atherosclerosis. An interpretive history of the cholesterol controversy: part I” delineated how, “John W. Gofman was not the first to try to characterize the full spectrum of lipoproteins in the blood, but he was the first to do so successfully. Gofman is a prime example of the unusual man who straddles two fields and as a result is able to see novel ways of applying methods and ideas from one field to the other.” The article concluded with: “In a 5- or 6-year period beginning in 1949, Gofman and his collaborators turned out a prodigious amount of new information about the lipoproteins in human plasma, their metabolism, and their correlation with atherosclerosis” (p.1591). “The impact of Gofman’s work on the field was of great and lasting importance.” (p.1592). 2007: the Journal of Clinical Lipidology re-published his quintessential 1954 work and named Dr. Gofman “The Father of Clinical Lipidology”. W. Virgil Brown, M.D, the Editor-in-Chief of the JCL, introduced the paper as “both a scientific tour de force and an historically important presentation of concepts that underpin our field ... [Gofman] not only discovered relationships previously unknown but defined important questions that remain unanswered even today ... [Many of his findings] were rediscovered later without credit to this work ... Once you have finished this paper ... you will understand why the name of ‘Father of Clinical Lipidology’ is fitting” (p.98). While engaged in the Plutonium Project during his graduate work at UCB, John Gofman met Ernest Lawrence. Lawrence had received the 1939 Nobel Prize for Physics, “for the invention and development of the cyclotron and for results obtained with it, especially with regard to artificial radioactive elements”. In 1931 as part of the UCB Physics Department, Ernest Lawrence founded the Radiation Laboratory. The research it conducted revolved around his invention, the cyclotron. Lawrence was very involved in the Manhattan Project during the war. In 1946 the Atomic Energy Commission (AEC) was created which transferred the control of atomic energy from military to civilian authorities. In 1952, Lawrence successfully lobbied the AEC to establish the UC Radiation Laboratory in Livermore, California. In 1954 Ernest Lawrence called Dr. Gofman into his office. While I was out there—to have something to do between times of roaming around—I organized a Medical Department at the Livermore Lab. It was then a lab of about fifteen hundred people. It’s now about seven thousand. I organized the Medical Department and served as the medical director. But I was there only a day or two a week. The rest of the time I was in Berkeley teaching. In 1957 Dr. Gofman decided he was finished with what he had set out to establish at Lawrence Livermore Lab regarding radiation safety, turned the Medical Department there over to Max Biggs, a former Ph.D. student, and went back to Berkeley full time to teach and return to his heart disease research. By 1960 Gofman felt he needed to re-focus his energies into something beyond heart disease research that would again engage his attention and creative curiosity. I decided that, although there was still a lot left to do in heart disease, the excitement of my early discoveries, the night and day work, wasn’t there any more. I’m not very good at dotting I’s and crossing T’s. If it’s not something really new and unknown, it’s not something I want to do. By then, two of my students were on the faculty and were doing very nice work. So I said, “I’m going to get out of the heart disease work totally. You take over.” They did, and they’re still there, doing fine work. I shifted my major emphasis to the study of trace elements in biology and worked hard on that from about 1959 to 1962. So I said, “having said that, I think you should think twice about whether I’m the right person to head this program.” I made [it] very clear exactly how I feel about it. Glenn Seaborg said in memorable words, “Jack, all we want is the truth.” If I’d ever seen the opposite of reality, this was it. An indication of how Gofman did not trust the AEC is his requesting and receiving from the President and Regents of UC Berkeley a signed letter stating that at any time and for whatever reason he was unhappy about the Livermore arrangement, he could return to Berkeley and resume his fulltime professorship with no questions asked. I think they felt they could always control it. It’s really complex. They probably figured people around me, like Johnny Foster, might very well remind me of what is appropriate behavior and so forth. I don’t think it was smart of them to give me that job.... I think they made a mistake in choosing me.... I think [Seaborg] had a high regard for my ability and work. I had done a good job at Berkeley when I was working with him in the war years. So I think that had some bearing. We were friendly all during the period from ’47 to ’60, when he went off to head the Atomic Energy Commission, but not terribly close at all. Dr. Gofman and the five other AEC scientists looked at Knapp’s data and concluded that his study was sound and ought to be published. The AEC man was very disappointed but could do nothing to override Gofman’s and the others authority to make the call to not suppress scientific truth. After returning to Livermore, Gofman described how quickly, after his appointment to the Lab, “within a matter of a few weeks one of [Seaborg’s] chief men at the AEC is asking us to help suppress the truth. So I came back to the lab and I told Johnny Foster, ‘Well, the first encounter with Washington was to help with a coverup.’... there was no further flap from that. But it taught me something about the Washington office—that they would lie, coverup, minimize hazards. My worst suspicions were confirmed.” Following this things went relatively quietly until 1969. In 1969 Dr. Ernest Sternglass, a physicist who had been studying infant mortality, published estimates that 400,000 children may have died from radioactive fallout from atmospheric nuclear bomb testing. His calculations were cited in a September 1969 article in Esquire magazine called “The Death of All Children.” At this time the AEC was trying to get the antiballistic missile program through Congress and they were afraid that if Sternglass’s estimates were seen as valid this could sink getting the ABM passed in the Senate. “No, the two things are just separate,” he said. At this point the conversation ended. Nothing further ever came back from Washington and Dr. Tamplin published his paper in the Bulletin. Gofman did acknowledge in Nuclear Witnesses that 10 years after this the new evidence coming out suggested to him that Sternglass may have been right. In 1969 Dr. Gofman was invited to be one of two featured speakers in the Plenary Session at the Institute of Electrical and Electronics Engineers (IEEE) conference held in San Francisco. On October 29 he presented a paper he and Dr. Tamplin had prepared titled, “Low Dose Radiation, Chromosomes, and Cancer.” Gofman summarized the paper’s talking point as, “One, there would be twenty times as many cancers per unit of radiation as anyone had predicted before, and two, we could find no evidence of a safe amount of radiation—you should assume it’s proportional to dose all the way up and down the dose scale.” Other than one article written in the San Francisco Chronicle the paper did not receive any national press. —John Gofman reply to Anna Mayo after her asking why he had not kept quiet. Interview appeared in The Village Voice after his IEEE talk. On November 18, 1969 Dr. Gofman was invited by Senator Edmund Muskie to address the Senate Committee on Public Works. Muskie was holding hearings on nuclear energy. He was not aware of Gofman’s IEEE paper and invited him to speak because he was associate director at Lawrence Livermore Laboratory. Gofman prepared a paper for the Senate Committee titled, “Federal Radiation Guidelines: Protection or Disaster?” that expanded on the IEEE paper. This time Gofman’s findings were picked up by the Washington press. What happened when we came out with some facts about cancer and radiation: Within two weeks certain officials of the AEC, not Glenn Seaborg, were denigrating our work publicly, saying to reporters that we were wrong, that we were incompetent. It was a most interesting situation. Here is the department of the AEC that had just awarded seven years of $3-to-3.5-million budgets to be used under my general guidance, since I was the associate director for biology and medicine at Livermore. And two weeks after we’d come out with a paper on radiation, cancer, and chromosomes — By the way, it was an invited paper from the Institute of Electrical and Electronics Engineers. In two weeks we became incompetent. Here’s somebody that for seven years gave me $3.5 million a year and couldn’t detect my incompetence; in two weeks I was incompetent. And, of course, they were trying to hide a great deal. Namely, trying to sell the idea of nuclear power as being cheap, clean, and safe. And our subsequent investigations directly went into the question of nuclear power and we’ve concluded that this industry is far, far from safe; far, far from clean; and the word cheap is really a joke because it is the most expensive imaginable way when you consider all the hidden subsidies and the costs that don’t show in the actual operation of the plant—namely your government subsidies—this is the most expensive way to produce power. After their November visit to Washington, both men were invited to testify before the Joint Committee on Atomic Energy in January 1970. In the middle of 1969, Dr. Gofman had resigned his position as associate director at Lawrence Livermore while remaining a research associate. He was now spending half his time at Livermore doing cancer and chromosome research and teaching part-time at Berkeley. Dr Gofman recounts what developed next. [A] lot of people from the electric utility industry ... were saying our cancer calculations from radiation were ridiculous, that they were poorly based scientifically, that there was plenty of evidence that we were wrong. Things like that. So I wondered what was going on there. At that point—January 1970—I hadn’t said anything about nuclear power itself. In fact, I hadn’t even thought about it. It was stupid not to have thought about it. I just wondered, Why is the electric utility industry attacking us? I began to look at all the ads that I had just cursorily seen in Newsweek and Time and Life, two-page spreads from the utilities, talking about their wonderful nuclear power program. And it was all going to be done “safely,” because they were never going to give radiation above the safe threshold. The system used to discredit scientists like us is usually to call you before the Joint Committee on Atomic Energy—it’s a Congressional committee—and they let you present your evidence, and then they get all their lackey scientists, the ones who are heavily supported, to come in and say why you’re wrong. In about three weeks we wrote fourteen scientific papers. I’d never done anything like that in my life. And we learned new things. Stuff was falling together. We took on the radium workers. We took some data on breast cancer. There was a whole study of radium workers and their deaths. A guy at MIT had said they wouldn’t get cancer below the safe threshold. We pointed out his papers were wrong. There were the uranium miners, who were getting lung cancer. And we analysed that and showed how it also supported the idea that there was no safe dose. We studied the dog data. Studies were being done at the Utah laboratory and sponsored by the AEC—they were irradiating dogs and studying how many cancers appeared. We took a whole bunch of new human and animal data and wrote fourteen additional papers that buttressed our position, that indicated, as a matter of fact, that we’d underestimated the hazard of radiation when we’d given the Muskie testimony. In all, Gofman and Tamplin wrote 24 technical reports, which came to be known as “The G-T Series.” They documented “in detail the much larger association of ionizing radiation with cancer-causation than had been previously estimated [and examined] all the major sources of data from known, human exposures (including certain medical therapies, the Hiroshima-Nagasaki data, the uranium miners, the radium dial-painters) as well as relevant data from animal exposures.” All 24 reports were submitted to two Congressional Committees: the Environmental Effects Of Producing Electric Power, Hearings before the Joint Committee on Atomic Energy, 91st Congress in October and November 1969; and the Underground Uses of Nuclear Energy, Hearings before the Subcommittee on Air and Water Pollution of the of the Committee on Public Works, U.S. Senate 91st Congress, Part 1, November 1969, and Part 2, August 1970. As was explained in the published listing of these reports, “It is no error ... that the date given to an entire volume may be earlier than the dates on materials included in that volume. Congress can operate that way.” Gofman’s and Tamplin’s strategy was well conceived, as in this manner the papers were given wide distribution by being published in their entirety in the Congressional Record and are available at large libraries which keep collections of Congressional Hearings. As preparation for testifying, Gofman and Tamplin had produced 178 pages of testimony. Dr. Gofman next described how he intended to address the challenges he knew they would be facing from the Joint Committee. —That’s always something you have to worry about. The journals can easily not publish what you want to say. It’s a simple technique. If the journals have editors and staffs supported by an industry or government agency, you can be blocked from getting your things published. [I took the] 178 pages of scientific stuff ... over to the Information Division at Livermore Lab. They nearly had a conniption fit. They had heard all the flack about this. Roger Batzel came running over to see me. We’ve always maintained a open dialog in spite of everything. He said, “What’s going on here? Why do you need this 178 pages of stuff and you want 250 copies?” I said, “Yes, Roger. Chet Holifield has invited me to speak at a hearing of the Joint Committee,” and I said, “If you don’t want to do it, I’ll call Holifield’s office and tell him the Lab has decided not to permit me to prepare this material for you, Mr. Holifield.” He said, “Oh no, no, don’t do that. We’ll do it.” So I got the 250 [copies], of which I sent 100 to scientists around the country, thinking it might be a good idea to have a copy out in some other people’s hands. We went in and I presented the thing. I thought they were going to just tear it apart. Holifield said, “Well, you submitted so much material. We haven’t had time to go over it. We’ll call you back. Do nothing until you hear from me.” So we never heard again from Holifield. After the preparation for and appearance before the Joint Committee on Atomic Energy, Dr. Gofman began to experience the chilling effects resulting from challenging the influence and reach of the political and corporate interests driving the atomic energy programs of the United States. The nuclear juggernaut Gofman and Tamplin began to confront head-on in this time period was a consequence of more than a half-century of disaster creep since Roentgen’s discovery of the X-ray in 1895 (see Disaster Creep - “Safe Doses” Belief Began Post-1895, below) followed by the confluence of further scientific innovation to make the atom bomb, Cold War politics, and the pursuit of profit. Beginning at the end of the 19th century, the dangers of looking only at the short time span for recognizing the health consequences of exposure to low dose ionizing radiation would lead to tragic and endemic denial of its true health effects by official bodies beginning in the 1940s through the remainder of the 20th century and beyond. After testifying before the JCAE, Dr. Gofman returned to the lab at Livermore and continued his research on chromosomes and cancer. Years later he recounted how his morning office hours prior to January 1970 were like Grand Central Station. Then his office changed into an empty space that no one else inhabited. During the period where I had been head of the department and Associate Director of the Lab, I had mornings open to anyone who wanted to come into my office: had all kinds of problems, needed another technician or their wife was sick, they needed this, or [one] needed that, or they wanted to talk about their research. It was Grand Central Station [un]til noon. Twelve o’clock noon, I went into the lab to work and I never would see people. I wanted to work. During those several weeks, both Tamplin and I were working until 11, 12, or 1 in the morning every night to try to get these papers ready for the Joint Committee. I noticed the most interesting thing during those weeks. Nobody ever came into my office again, nobody. From Grand Central Station to a desert. Nobody needed to see me at all. A revealing example of how truly desperate the Atomic Energy Commission was to destroy the credibility of Drs. Gofman and Tamplin—and maintain the lies and deceptions it had been making with the false claim that there was a “safe” level of exposure to radiation—came in this time period of January 1970. Gofman recounts how none other than Dr. John Totter visited a member of the Public Health Service who had received a copy of the G-T Series papers Gofman had mailed out. Outlaw the concept of a “tolerance” [permissible] dose of any by-product poison. Abolish the dual role of promoter and protector for any agency, governmental or otherwise. Establish the principle that the only proper tolerance dose of any poison is zero. Instead of halting all technological advancement, require that the current or prospective polluters prove their cases in favor of specific levels of pollution above zero. The energy industry has no place in its ledgers marked "health and welfare of future generations." Therefore, the task of accomplishing a moratorium and providing a sane energy economy cannot be entrusted to that industry. But individuals in society do have a moral obligation to avoid recklessness and extremism in dealing with the future of living creatures on earth. Given the nature of the real problem of nuclear power, a problem admitted by proponents and opponents of nuclear power, it is difficult to understand the position of anyone who is not insistent upon an immediate moratorium on all nuclear fission power generation. From this one can see the evolution of Dr. Gofman’s thinking—from a reduced permissible radiation dose (Oct 1969) to zero dose as the default level (April 1970), to a 5-year moratorium on licensing any more nuclear plants until the potential consequences for human health is better understood (August 1970), to terminating the licenses of all operating nuclear power plants (November 1972). In 1970 Gofman and Tamplin proposed establishing an “Adversary Science” program where governments and polluters would be required to provide the funds for experts whose duty would be to uncover and publicly present the case against a proposed or existing activity. In May 1971, Dr. Gofman became Chairman of the newly formed nonprofit research and educational group, the Committee for Nuclear Responsibility (CNR). Established by Lenore Marshall, a poet concerned about nuclear issues, it was the first national anti nuclear group. CNR’s Mission was “to provide independent analyses of sources and health effects of xrays and other ionizing radiations.” Others who joined Gofman on CNR’s Board of Directors included: Prof. Lewis Mumford, and Nobel Laureates Linus Pauling, Harold Urey, and George Wald. One of CNR’s priorities is to make actual progress in preventing cancer, by helping other groups and individuals to eliminate the careless xray overdosing which occurs today in medicine. Xray dosage can be cut in half (or more) without interfering with good diagnostic information. CNR supplies the evidence for such action, and regards “getting the job done” as an ethical imperative—because every action which reduces unnecessary irradiation is guaranteed to prevent a share of future cancers which would otherwise occur. A second function of CNR is helping other groups and individuals to prevent additional nuclear pollution of the planet. The importance of such prevention is supported by CNR’s detailed proof that there is no safe dose (threshold dose) of ionizing radiation with respect to causing mutations and human cancer. Following these Goals, a more detailed and specific purpose was expressed that is as necessary to pursue, and as relevant today, as it was in 1971. The real reason for our existence is to counter the unrealistic information provided by some other sources. Radiation from xrays, nuclear pollution, and other sources of ionizing radiation, can injure our genetic molecules—DNA and chromosomes. Radiation-induced damage cannot always be successfully repaired by our cells because damage from ionizing radiation can be especially complex. Cancer and inherited afflictions are caused by damaged genetic molecules. Ionizing radiation is a proven cause of human cancer. None of this is in dispute, none of this is speculative. Nevertheless, exposure to ionizing radiation is seldom listed as a “risk factor” for cancer and inherited problems—even though it may well be the single most important cause to which everyone is exposed. Today, the largest sources of willful radiation exposure are diagnostic medical irradiation and work-related doses. In the future, nuclear pollution may exceed those sources, if citizens become lazy watchdogs. The powerful medical and nuclear industries do not educate people realistically, in our opinion, about the aggregate consequences of 200 million xray procedures per year in the USA, and about the aggregate consequences of low-level nuclear pollution. The tobacco industry was not the leader in warning people about the health consequences of smoking, either. In 1971 the AEC began to push the Administration at Livermore Lab to phase out Gofman’s program of laboratory research on chromosomes and cancer. This situation culminated with his resigning from the Lab in February 1973. He then returned to teaching full-time at Berkeley, and chose an early and active “retirement” in 1974 as Professor Emeritus of Molecular and Cellular Biology in order to fully devote his time on pro-bono research into human health-effects from radiation. While still research associates at Lawrence Livermore, Drs. Gofman and Tamplin wrote a book for lay people that summarized their research into the grave dangers posed by man-made nuclear pollution. It was published in 1971 under the title, Poisoned Power: The Case Against Nuclear Power Plants. It explained how atomic radiation created in the operation of nuclear power plants will result in many more deaths from cancer and leukemia than had ever been acknowledged by the AEC, government officials, or the nuclear power industry and how the potential injury to future generations from genetic damage was even more grossly underestimated. The book was reprinted in 1979 with the extension to the subtitle: The Case Against Nuclear Power Plants Before and After Three Mile Island. The 1979 edition is available online in its entirety. More than 40 years later, the facts, comparisons, and insights presented are as relevant today as they were when first published. Two examples illustrate the book’s value in educating the public about the dangers posed by nuclear power and its advocates that previously were simply omitted from government and commercial media claims and pronouncements. One year of operation of a single, large nuclear power plant, generates as much of long-persisting radioactive poisons as one thousand Hiroshima-type atomic bombs.... Once any of these radioactive poisons are released to the environment, and this we believe is likely to occur, the pollution of our environment is irreversible. They will be with us for centuries. It is important that people learn how they are likely to be exposed to such poisons and how death-dealing injury is thereby produced in the individual and in all future generations. The insurance industry gave nuclear power a “No Confidence” evaluation by inserting exclusion clauses into most Homeowners’ policies if homes and property suffered damage from radioactivity and nuclear plant accidents. The electric utility would not have ventured into nuclear power if they could be held liable for possible disastrous accidents. A bill was proposed, known as the Price-Anderson Act, which simply eliminated individual liability in the event of a major accident in a nuclear electricity plant.... The key point, over and above the lack of confidence of the insurance industry in nuclear electricity plants, is the utter disregard of personal rights the Price-Anderson Act represents for the average citizen. Since the maximum coverage is 560 million dollars per nuclear electricity accident, and since the damage can run to 7 billion dollars, in a serious accident, the individual might recover only 7 cents out of every dollar lost, assuming he is lucky enough to emerge from such an accident with his life. The concluding section of the 1979 Foreward to Poisoned Power emphasizes the primary issue present throughout the history of nuclear power. It is not about the technical issues from those who propose employing and advancing this technology throughout society. It is the ethical and moral considerations that form the basis of any rational dialogue concerning pursuing this extremely hazardous technology for the purpose of boiling water to run a turbine to generate electricity. The use of lies and deception by the nuclear industry in order to manipulate public opinion, and in order to use people, even kill people, for the benefit of that industry. The experimentation on people without their knowledge or consent. The genetic degradation of the human species, vs. our minimum responsibility to protect our species’ genes from injury. The need to hold bureaucrats and industry employees personally accountable and responsible for implementing hazardous and even murderous policies, even if such policies are advocated by Congress and the President. Yes, Poisoned Power is a sad story about the absence of ethics and morals in men. But it is not too late to jolt society into realization of what is going on, and what is in the future if humans do not improve in the very basic and minimum principles of morality. Either we improve, or the future is dismal indeed. We hope that Poisoned Power upsets you enough to make you work toward such improvement. In 1981, Dr. Gofman had gathered and analysed the data from every valid existing study of low-level radiation to demonstrate that official estimates of radiation health hazards had been seriously underestimated. Published in a 908-page compendium entitled, Radiation and Human Health, the cover’s subtitle reads, “A comprehensive investigation of the evidence relating low-level radiation to cancer and other diseases”. The book’s purpose was described in the dust jacket. how to evaluate the genetic consequences to future generations of our own radiation exposures. This profoundly important book offers an original and urgently needed evaluation of the risks associated with a wide variety of radiation sources, from the dramatic (such as nuclear accidents and weapons-testing) to the commonplace (exposures from building materials, color televisions, and normal “background” radiation). In pages 52-53 of the book, Dr. Gofman explains what causes “the enormous effectiveness of ionizing radiation” by comparing it with a fever. This explanation and its expression is representative Gofman’s skill in describing highly complex biological and physical processes in a manner accessible to lay people. The same logic—having to do with the unique physical properties of ionizing radiation compared with heat—also explains the potency, or “effectiveness” in the jargon of radiation biology, of ionizing radiation compared with chemical toxins and chemical pollutants. In the following, the caret character ^ indicates that the next number is an exponent. Thus far we have not concerned ourselves with the special properties of ionizing radiation except to note that the energy of a beta particle, for example, can be 100,000 or even 1,000,000 or more times greater than the energy required to break even a strong chemical bond in biological tissue. But that does not tell us the whole story about the enormous effectiveness of ionizing radiation energy in producing devastating biological effects such as cancer and even virtually immediate death. Just how much energy is represented by one rad? And how effective is that energy in producing biological injury compared with other modalities which might deliver energy to tissues? As an interesting comparison, we may compare the biological effectiveness of energy from ionizing radiation with energy from heat (Gofman 1960). The best estimates are that approximately 400 rads of whole-body radiation, if delivered rapidly, are sufficient to cause 50% of the exposed humans to die within a period of days to weeks. This is the so-called acute radiation sickness. Is this a great deal of energy in heat terms? Some simple calculations will show that it is not. We can round this off to approximately 10^-3 calories/gram (or 0.001 calories/gram). Biological tissue is quite comparable with water in the amount of heat required to raise its temperature by one degree centigrade. So we shall say that the required amount is one calorie per gram for biological tissue too. Therefore, our 10^-3 calories/gram from the absorption of 400 rads of ionizing radiation energy would be enough to raise the temperature of biological tissue by 0.001° centigrade. Not much of a fever! We tolerate fevers of several degrees centigrade (not thousandths of a degree) in a variety of infectious diseases. Yet the amount of ionizing radiation that can kill half of the humans exposed to it, would—if converted first into heat—raise temperatures only by 0.001° centigrade. This points up the biologically deadly difference between energy in the form of heat versus the same amount of energy in the form of ionizing radiation. Why is the effect of ionizing radiation so much larger? The difference resides in the fact that the energy of ionizing radiation is not distributed the way the thermal energy of a fever is, the latter being about evenly distributed among all the molecules of a gram of tissue. Instead, the energy of ionizing radiation is transferred from photons to single electrons, which in turn transfer all their energy to relatively few electrons in relatively few molecules. The transfer occurs in extremely concentrated fashion compared with the even diffusion of heat energy. Therefore, the energy delivered by ionizing radiation is energetic enough to break any chemical bond, even the strongest ones in living tissue. We shall learn later that certain chemical bonds in cells are crucial, and breaking just a few of these bonds may set a cell on the path to cancer. Gofman, J.W. Medical aspects of radiation. In Modern Nuclear Technology: A Survey for Industry and Business, chap. 15. Edited by M.M. Mills, A.T. Biehl, and R. Mainhardt. New York: McGraw-Hill, 1960. Radiation and Human Health was published in the year after the release of the quasi-official Committee on the Biological Effects of Ionizing Radiation 1980 BEIR Report. It challenged a number of BEIR’s methods and conclusions. From this, the New York Times convened a three-way discussion with Dr. Gofman and two members of the BEIR committee, one of whom was its Chairman, Edward Radford. It was titled “With Radiation, How Little Is Too Much?” and appeared in the Sunday “Week in Review” section. Dr. Gofman found it hard to believe that medicine tolerated the administration of x-rays, a powerful, proven carcinogen and mutagen without insisting on measurement. Medicine is producing harm and should clean up its act. We’ve got the competence in the form of health physicists and radiation physicists to show the way. While emphasizing that diagnostic X-rays produce benefits as well as risks, the authors, radiation expert Dr. John Gofman and science writer Egan O’Connor, show how the risks can be dramatically lowered by specific steps which individual readers can take on their own to avoid unnecessarily high X-ray doses. They point to recent research data from the Mayo Clinic and Case Western Reserve, where teams have cut the risk of breast cancer more than 60-fold, from upper spine exams, by developing ways to reduce dose. Similar efforts could prevent 1.5 million cancers among Americans in one generation without eliminating a single X-ray exam. Dr. Gofman’s concern regarding unnecessarily higher doses received from medical irradiation than are required to produce the same diagnostic benefits would continue to be incorporated into his research and future books. On September 9, 1986, Dr. Gofman presented his estimate of the cancer consequences of the Chernobyl accident, as an invited speaker at the Low-Level Radiation Symposium of the 192nd National Meeting of the American Chemical Society. The title of his presentation was, “Assessing Chernobyl’s Cancer Consequences: Application of Four ‘Laws’ of Radiation Carcinogenisis.” His figure, never modified, was a half million undetectable fatal cancers from the cesium fallout alone. Undetectable? Yes. Because the extra cancers would occur over a vast geographical area and over a century, even a half million fatal cases would be undetectable against the much higher “background” cancer rate. He thought Sherlock Holmes would be impressed by the capability to kill a half million people and get off scot free. His estimate was well covered by the press services, to the likely dismay of the nuclear industry which had a significant presence at the meeting. In 1990, the further development and continuing refinement of Dr. Gofman’s research was published in Radiation-Induced Cancer from Low-Dose Exposure: An Independent Analysis. (A majority of the book is available online.) It included a powerful challenge to the popular “threshold” hypothesis which proposed that, at some unspecified low dose, repair of radiation-injured genes and chromosomes would be perfect, and that below such a “threshold dose,” exposure to ionizing radiation would be risk-free. Combining his knowledge of how ionizing radiation delivers its energy along primary ionization tracks, with existing evidence of cancer-induction at low doses, he was able to prove “by any reasonable standard of biomedical proof” that no exposure to ionizing radiation is risk-free with respect to DNA mutations. The core of this comprehensive proof is presented in Chapter 18, “Disproof of Any Safe Dose or Dose-Rate of Ionizing Radiation, with Respect to Induction of Cancer in Humans,” with Chapters 19 through 21 comprising the Auxiliary Chapters on the Threshold Issue. Combined, these chapters form Section 5: Disproof of Any Safe Dose or Dose-Rate. Within three years, the quasi-official radiation committees (the United Nations committee, the British committee, and two American committees) began gradually but openly to publish the same conclusion. The book was compared very favorably in the New England Journal of Medicine review with the 1990 BEIR Report. It was also translated and published in Russia right after the U.S.S.R. disintegrated. Dr. Gofman soon received e-mail from a Russian geneticist calling it “a masterpiece.” A traveling American “activist” reported that he saw this book and also the 1994 one (below) on the desk of every environmentalist he visited in Russia, Belarus, and Ukraine. From the Right Livelihood Foundation in Sweden Dr. Gofman received the Right Livelihood Award in 1992. Dr. Jakob von Uexkull’s statement, in presenting the award to John Gofman “for his pioneering work in exposing the health effects of low-level radiation,” was: “The Right Livelihood Award for vision and work forming an essential contribution to making life more whole, healing our planet, and uplifting humanity.” Gofman donated the entire award he received to the Committee for Nuclear Responsibility. Along with Dr. Gofman’s speech given at the award ceremony on December 9, 1992, “A Key Step in Protecting the World’s Health,” he also wrote a paper on the occasion of the award entitled, “Bio-Medical ‘Un-Knowledge’ And Nuclear Pollution: A Common-Sense Proposal.” More than 20 years later, this paper retains its timeliness. A few excerpts convey a sense of the import. After [losing government funding for lab research at Livermore and] returning full-time to my professorship at the University of California, I have been thinking about the implications for humanity of the conflict-of-interest problem. How can humanity have even the remotest chance of protecting its own health, when an agent of poisoning the population is also the sponsor of virtually all the health research concerning the pollutant? To help prevent production of false databases and false “findings,” either through bias or scientific error, medical science has developed some basic Rules of Research. Adherence to these rules is essential for conducting scientifically credible studies of Chernobyl’s radiation consequences. For comparing exposed and non-exposed groups in epidemiological studies, some basic rules are abbreviated below. Common-sense proposals—like independent “watchdog authorities”—are the easy part. The hard part is reaching a critical mass of international support sufficient to establish and sustain mechanisms which will cope with the thrust of “concentrated benefit” in all sorts of areas. Since human nature is not going to change its range and distribution, we have to become realistic about controlling its darker aspects. The concept of independent “watchdoggery” is such a control, needed to offset a great conflict of interest in certain types of research. The axiom of Concentrated Benefit over Diffuse Injury accounts for the current promotion of a “de minimis” policy toward nuclear (and other) pollution. A de minimis policy asserts that society should not concern itself with trivia. (Latin: De minimis non curat lex. The law does not concern itself with trifles.) A de minimis policy toward pollution asserts that poisonous discharges and human exposures below a certain level should be treated as non-existent—because their consequences are allegedly trivial. Even after a nuclear accident as severe as Chernobyl, it is unrealistic for an irradiated population to feel, “We are all doomed,” or “The children are all doomed.” Although the aggregate number of Chernobyl-induced cancers will be very large—at least a million over all time—this will occur not because everyone in fallout areas has a high personal risk of cancer from Chernobyl. It will occur because there is no safe dose, and therefore the accident creates a small extra risk of cancer for many people (over 500 million exposed individuals, inside and outside the ex-USSR). What counts biologically is the sum of all the injuries over time from ALL the combined sources and events which release persistent poisons (radioactive or other) into the biosphere. If the sum matters biologically, then each contribution to the sum matters. Whoever consents to the small releases is consenting automatically to their worldwide sum, whatever it turns out to be. In 1994, by request from citizens in Belarus for an independent expert opinion about the probable health consequences from the nearby Chernobyl accident, Dr. Gofman completed Chernobyl Accident: Radiation Consequences For This And Future Generations. Published in Russian only, it is a 574-page book in which he provided lessons in radiobiology and explained how he derived his estimates. The book sold out immediately, except for some copies that were reserved as graduation gifts for medical students at the Minsk Medical Institute. Presumably both the 1990 and 1994 books had considerable impact in the former Soviet Union, where people no longer trusted experts employed by any government. On March 20, 1995, Dr. Gofman submitted a Supplement—reproduced below in full—to the Oral History he had participated in as part of the Human Radiation Experiments Oral Histories. This program was initiated in December 1993 by U.S. Secretary of Energy Hazel O’Leary. The Supplement provides context regarding how, in the five decades preceding the Manhattan Project, the dominant biomedical community erroneously believed that exposure to low dose ionizing radiation was of no consequence. Once this bias of missing the boat concerning cancer induction had been adopted over decades, the imperative to continue operating with the “no problem from exposure to low-dose radiation” mindset predominated. This overrode all voices urging caution or that the medical community’s prior guidance was wrong. It is my opinion based upon some major studies I have accomplished in the past year that it is a grave mistake to consider “human radiation experiments” as a phenomenon peculiar to the advent of large-scale atomic energy. In fact, the really significant events were in 1895 (Roentgen’s discovery of the X-Ray), and 1898 (the Curie’s discovery of radium). The true era of massive human radiation experimentation began very shortly after Roentgen’s work, and by the 1940-1945 period, all the features were in place that ASSURED we would have precisely what has been found to have been the case in the post-1945 period. But there really was nothing special about the human experiments beginning after 1945. 1. Humans in recent decades (last couple of hundred years) operate on the technological imperative. Whatever is discovered must be applied immediately. There has been no thought, until recently, about DISASTER CREEP which can occur as a result of looking only at the short span of time for consequences of exposure to new technologies. 2. A special example of disaster creep is the inordinately long latent period before the full flowering of cancers following exposure to carcinogens such as ionizing radiation. The time is clearly at least 50 years and it may really be 60 or more years. THE RESULT: The bulk of cancers from x-radiation and radium gamma rays simply were not seen, partly because of the long latency and partly because the idea that long-term follow-up was essential was clearly dismissed in the half-century after the Roentgen discovery. THE FALSE CONCLUSION: Doses of 200, 400, 600, and even over 1000 Roentgens of exposure to partial body radiation were erroneously exonerated as cancer producers. Millions of cancers were set in motion in the populations receiving ionizing radiation in the half-century before the A-bomb. And this set the stage for all the events recently receiving notice. How? Radiation below 500 to 1000 roentgens of exposure was ridiculed as being of no consequence by failure to look at the follow-up of persons exposed. When the post-Hiroshima era resulted in the massive Atomic Energy Bureaucracy, with all the biases built-in from 50 years of having missed the boat concerning cancer production, WHO WAS PUT IN CHARGE OF THE PROGRAM ON HEALTH EFFECTS? THE VERY PEOPLE WHO HAD A TOTAL BIAS IN FAVOR OF “No Problem from Low-Dose Radiation.” Although there should have been more thoughtfulness over the uranium miners and dial painters, somehow the idea became accepted that beta particles and electromagnetic radiation simply had shown themselves not to be a worry. Alpha particles, grudgingly yes. Not that these people were correct. THEY WERE NOT. But I am describing the atmosphere in which these individuals came to be the dominant forces in setting up the post-war era of biology and medicine of irradiation. The bias was overwhelming, and with their short-sighted look at the problem, it seemed as though they really believed there was no harm. That was the EARLY phase post-war. But once the bureaucracy was set up and the movers and shakers were told, “No problem with health issues,” the door was opened wide for all sorts of proposals from nuclear power, massive uses of radionuclides in medicine and elsewhere, and even all the “Plowshare” ideas. This set up a new phase. Once the biologists had told the high moguls there was no problem with health effects, all kinds of wheels were in motion and from there on out, the biomedical people had to try to have biology conform to their erroneous view of what the real truth was. And all hell would break loose if the moguls had been embarrassed by the poor biological guidance from an inept biomedical community. And that community, seeing this golden goose of unlimited funds for research and grants, simply was not in any mood to say, “Go Slow,” or that our prior guidance was wrong. We are now slowly coming off that erroneous mountain—but because so much prestige and so much funding have gone into the enterprise, the easiest path is denial that any problem exists at doses of a few rads. After all these same people just a couple of decades earlier were telling the Congress and the public that 500 to 1000 rads were “Safe” exposures. I have recently found even more evidence that this was the prevailing view at the bureaucratic top. There is a fundamental rule that exposing persons to a potential poison, with an assurance of safety when that cannot be assured, is fraudulent. At the very least, this constitutes human experimentation, with its Nuremberg connotations. Such experimentation is commonplace today, with so-called safe standards being set for “tolerance” doses. The idea of safe doses was much much more in error for the 50 year period before the atomic bomb. Now we can go into the Oral History, but I think failure to appreciate the 50 years before the a-bomb completely confuses the persons looking into the ethics of so-called “human experimentation.” The outcome WAS CRADLED long before the post-bomb period, and was an inevitable expectation. I have felt these conclusions needed to be here. They have resulted from an in-depth year-long investigation of the extent to which ionizing radiation, primarily medical x-rays and radium gamma rays, accounts for the current level of breast-cancers. We estimate that 75 % of all breast-cancers were and are induced primarily by medical irradiation. Most of that was in the horrendous use of fluoroscopy and the equally questionable uses of radiation in the therapy of benign diseases—from dermatologists to rheumatologists. There is some REAL human experimentation. Also in 1995, the first edition of Preventing Breast-Cancer: The story of a Major, Proven, Preventable Cause of This Disease was published. It presented Dr. Gofman’s careful estimates of how much breast cancer in the United States was due to earlier medical x-rays during the 1920 to 1960 period. A second edition published in 1996 is available online in its entirety. The following quotes offer starting points into this study. Bottom line: The recent increase in breast-cancer incidence is not a mystery. About 75 % of annual incidence is caused by earlier exposure to ionizing radiation, primarily medical x-rays. The task is not to reject medical uses of radiation, which are often very beneficial for women. The task is for everyone—most especially women and their physicians—to get busy providing those benefits with vastly less harm. Radiation dose-levels from mammography have already been reduced by 30-fold compared with doses twenty-five years ago. This study makes it clear that it would be criminal not to make the same serious effort to reduce unnecessarily high doses in other radiation procedures. Dr. Gofman has a track-record of being right. For example, he led the group which demonstrated the existence of diverse low-density lipoproteins (LDL) and high-density lipoproteins (HDL). Their work on lipoprotein chemistry and health consequences included the first prospective studies demonstrating that high LDL levels represent a risk-factor for coronary heart disease and that low HDL levels represent a risk-factor for coronary heart disease. Although resistance to their findings was fierce at first, their work stood the test of time and became very widely accepted. Now Dr. Gofman’s 1995 book identifies earlier medical irradiation as the major cause of the breast-cancer problem in the USA—and he expects that the finding will be highly unwelcome in some circles of medicine and government. A few individuals may promptly deny the finding without even reading the work. By contrast, the book solicits thoughtful peer-review from objective sources who “read first, judge second.” It is worth emphasis that Dr. Gofman’s book is fully compatible with roles for additional causes of breast-cancer (see Index: “Co-action of cancer-causes”). There are 182,000 women every year (USA), newly diagnosed with breast-cancer, who want to know, “Why me?” This book can provide an explanation for many of them ... and can help numerous women (and their daughters) to avoid this dreaded disease. Many of the cases which will be diagnosed 10 to 50 years from today, are being induced now. Preventing Breast Cancer led to Dr. Gofman’s final book, not yet well known. He thought only time would tell if it was his most important contribution to human health or not. The 1999 medical monograph is titled: Radiation from Medical Procedures in the Pathogenesis of Cancer and Ischemic Heart Disease: Dose-Response Studies with Physicians per 100,000 Population. The complete books is available online in PDF format with ”Section One - Orientation, Materials, Methods“ also in hypertext. In his last study, Dr. Gofman tackled an ostensibly impossible scientific problem: How to make a reality check on the comfortable assumption that medical x-rays have been a trivial cause of cancer, when no records exist of accumulated lifetime x-ray doses for even a single person. He considered it a very important task, not only because of the warning from his 1995 investigation, but because medical x-rays are several times more powerful as a mutagen, per unit of energy delivered to human tissue, than such common nuclear pollutants as cesium-137. And medical x-rays had been in very widespread use in the U.S. since 1900. Medical radiation is a highly important cause (probably the principal cause) of cancer mortality in the United States during the Twentieth Century. Medical radiation means, primarily, exposure by xrays (including fluoroscopy and CT scans). Medical radiation, received even at very low and moderate doses, is an important cause of death from Ischemic Heart Disease; the probable mechanism is radiation-induction of mutations in the coronary arteries, resulting in dysfunctional clones (mini-tumors) of smooth muscle cells. People often hear of the term hypothesis and think that, ‘Oh it’s just hypothetical.’ These are totally different concepts. Hypotheses are just speculation if they’re not backed up by any evidence. But when hypotheses, such as these, are backed up by the evidence, then that becomes the very essence of scientific knowledge and medical progress. And there is a mountain of evidence in my new work which supports both of the hypotheses that are on the front cover of this [Executive Summary]. The first hypothesis on the cover is that medical radiation is a highly important cause of cancer mortality in the United States. And the new evidence strongly supports the estimate that over half of all the cancer deaths in the United States would be absent in the absence of accumulated exposure to medical radiation. Writing in the year following the book’s publication, Dr. Gofman described its method of evaluating Two Totally Trustworthy Databases. Because medical xray doses were not measured in the past, and are rarely measured today, both past and current dose-estimates are highly uncertain. But we recognized that the problem (of estimating the impact of medical radiation on national age-adjusted cancer mortality-rates) might be solved by using data which are available—namely, the number of Physicians per 100,000 Population (“PhysPop”) in each of the nation’s Nine Census Divisions. Physicians (not patients) order xray procedures. As the density of physicians goes up per 100,000 population, more xrays will be ordered per 100,000 population. This common-sense premise is supported by surveys reported in 1988. In each Census Division, the population’s average per-capita xray dose will be approximately proportional to the Census Division’s PhysPop value for the same year. Thus, the nine PhysPop values are a valid indicator of the relative magnitude of annual per-capita xray dosage received by the nine populations of the nation’s Nine Census Divisions. However, we had to ascertain that PhysPop would be a valid indicator of accumulated per-capita xray doses, not just the doses received in a single year. It turns out that the relative magnitude of PhysPop values was remarkably stable, among the Nine Census Divisions, from 1921 to 1990. These two databases permit our study to begin in 1940, by “enrolling” all 150 million inhabitants of our Nine Census Divisions into the study. (The study ends in 1990, when the combined population was 247 million.) By contrast, the A-Bomb Study has about 90,000 participants—which severely limits its power to discern provable differences between dose-groups. Our PhysPop study is probably the largest, statistically strongest, prospective study of radiation health-effects ever done—and it was done with assuredly neutral data. One should go where the trustworthy data are, and we did. Our PhysPop study revealed not only that medical xrays are an extremely important cause of the nation’s past and present cancer mortality, but it produced the first powerful evidence that ionizing radiation is also an extremely important cause of the other biggest killer in the nation: Ischemic/Coronary Heart Disease. To assume that these striking findings are irrelevant to issues of nuclear pollution, because the insights derive from medical xrays, would be a serious mistake (Part 4, above). It would be self-defeating to ignore undeniably strong findings from any immense, neutral, highly credible database—in favor of perpetual dependence on marginal findings from the A-Bomb Survivor Database, the nuclear worker databases, and other databases with unreliable dose-estimates, retroactively altered input, and pro-nuclear management. It would make good sense to avoid an exercise in self-defeat. The stakes for posterity are very high. Dr. Gofman repeatedly emphasized that recognition of the aggregate consequences of individually small risks was critical in assessing the severity of health consequences from the sources of nuclear pollution. The following, from his 1990 monograph, Radiation-Induced Cancer, reflects the understanding regarding the de minimis policy expressed in The Law of Concentrated Benefit over Diffuse Injury (above). People of goodwill need to look closely at the aggregate consequences of individually small risks. If pollution sources of all types are regulated individually, and each is allowed under the “de minimis” concept to kill one person in 100,000 (a low individual risk), then only 10,000 sources could kill up to one tenth of the population. And no one would ever be able to prove it. The fact, that xray doses are so seldom measured, reflects the false assumption that such doses do not matter. This monograph has presented a mountain of solid evidence that they do matter, enormously. And each bit of additional dose matters, because any xray photon may be the one which sets in motion the high-speed high-energy electron which causes a carcinogenic or atherogenic mutation. Such mutations rarely disappear. The higher their accumulated number in a population, the higher will be the population’s mortality-rates from radiation-induced Cancer and Ischemic Heart Disease. The xray is a proven mutagen and a proven cause of Cancer, and the evidence in this book strongly indicates that it is also a very important cause of Cancer and a very important atherogen. From the existing evidence, it is clear that average per patient doses from diagnostic and interventional radiology could be reduced by a great deal without reducing the medical benefits of the procedures in any way (Part 9, above): Same procedures, at lower doses. Unless effective measures are taken, to eliminate uselessly high dosage, medical radiation will continue in the next century to be a leading cause of Cancer and Ischemic Heart Disease in the United States, and will become a leading cause in the “developing” world, too. I have spent a lifetime studying the causes of Ischemic Heart Disease, and Cancer, in order to help prevent such diseases. So it would be pure hypocrisy for me to feign a lack of interest in any preventive action which would be both safe and benign. And when sources, completely independent from me, set forth their findings that such action is readily feasible—namely, significant dose-reduction in diagnostic and interventional radiology—it would be worse than silly for me to pretend that I have no idea what action should occur. After all, as a physician, I took the Hippocratic Oath: “First, do no harm.” Silence would contribute to the harm of millions of people. and countering the unrealistic information provided by some other sources. Beginning as a graduate student in the Plutonium Project, his experiences gave him an applied understanding of the chemistry of artificial radioactivity. His innovative research into lipoproteins, cardiology, atherosclerosis, and coronary heart disease and its causes, treatments, and prevention resulted in the sorts of breakthrough contributions acknowledged above. Beginning in 1963, his second tenure at Lawrence Livermore Laboratory afforded him ideal conditions for the highest quality lab facility from which to pursue research into the health effects of radiation and radionuclide release from weapons testing, nuclear war, radioactivity in medicine, and nuclear power. And when the results of his and Dr. Tamplin’s research led them to conclude that radiation was much more dangerous than previously understood, they did what Dr. Gofman had told Glenn Seaborg in 1963: “We’ll investigate these problems, but you’re not going to get me to be silent and use the secrecy stamp to keep something from surfacing that I think the public ought to know.” Gofman’s recollection in 1973 about initially going public affirmed his remaining true to announcing what the public ought to know. We presented this [1969 paper on “Low Dose Radiation, Chromosomes, and Cancer”] in a totally low-key manner on an invitational paper at the Institute for Electrical and Electronic Engineers just thinking that people involved in the radiation field should know that radiation was much more hazardous with respect to cancer than it had been thought to be. While the two men did not anticipate the firestorm that would confront them by fulfilling their commitment to public health and the public’s right to know, once the battle was engaged they did not shrink from the ethical duty it required of them. I’m perfectly happy in Berkeley. I’ve got my research. I’m up to my neck in my trace element research. I’ve gone down from having to supervise fifty people in my heart disease project to where I now have three people working with me. And it’s just the way I like to work. I can be in the lab, and I don’t have to think about administrative details. Egan O’Connor worked with Dr. Gofman as his assistant from 1970 until his death in 2007. Recently she shared the following regarding the duty he felt he had to fulfill. JWG confirmed many times privately the fact that he would have much preferred to stay in the lab and continue cutting edge research, than to become a crusader and to use the crude tool of epidemiology forevermore. But it was a duty—to check out the claims of “trivial harm” from the permissible dose-level. Before the 1969 IEEE paper, he did not dismiss that as possibly being true. His 1969 IEEE paper assessed all the existing but thin human evidence, which existed only on a few cancers. It did not exist for heart disease or heritable afflictions at that time. The causes of heritable afflictions were not even well understood. Nor was the role of mutations well understood. Dr. John Gofman’s interest in exploring the unknown has contributed much to what we as a species now understand and must address regarding further exposure to low-level ionizing radiation. The following exemplifies this, his dedication to public health protection and the right to know. There Is No Safe Dose of Radiation. There Is No Safe Threshold. In a 1994 interview with the UCSF student newspaper, synapse, Dr. Gofman reviewed what would constitute a safe level of exposure to radiation. How would a safe level of radiation come about? It could come about in theory if the biological repair mechanisms—which exist and which will repair DNA and chromosomes—work perfectly. Then a low dose of radiation might be totally repaired. The problem, though, is that the repair mechanisms don’t work perfectly. There are those lesions in DNA and chromosomes that are unrepairable. There are those where the repair mechanisms don’t get to the site and so they go unrepaired. And there are those lesions where the repair mechanisms simply cause misrepair. We can say that between 50 and 90 percent of the damage done by ionizing radiation is repaired perfectly. What we are then seeing is harm done by the residual 10 or 40 or 50 percent that is not repaired perfectly. Gofman is summarizing what he details concerning these three forms of genetic damage in Part 2, “A Troublesome Trio: Unrepaired, Unrepairable, Misrepaired Injuries,” of Chapter 18, “Disproof of Any Safe Dose or Dose-Rate of Ionizing Radiation, with Respect to Induction of Cancer in Humans,” from Radiation-Induced Cancer From Low-Dose Exposure. In the interview he goes on to provide a distillation of how there cannot be a safe dose of radiation. [I]onizing radiation is not like a poison out of a bottle where you can dilute it and dilute it. The lowest dose of ionizing radiation is one nuclear track through one cell. You can’t have a fraction of a dose of that sort. Either a track goes through the nucleus and affects it, or it doesn’t. So I said ‘What evidence do we have concerning one, or two or three or four or six or 10 tracks?’ And I came up with nine studies of cancer being produced where we’re dealing with up to maybe eight or 10 tracks per cell. Four involved breast cancer. With those studies, as far as I’m concerned, it’s not a question of ‘We don’t know.’ The DOE has never refuted this evidence. They just ignore it, because it’s inconvenient. We can now [in 1994] say, there cannot be a safe dose of radiation. There is no safe threshold. If this truth is known, then any permitted radiation is a permit to commit murder. Just One Part in a Thousand? It may sound like a trifle to put only one part per thousand of a poison into the environment, but we will show what one part per thousand means with respect to radioactive cesium. The cesium-137 produced each year by a 1000-megawatt (electrical) nuclear power plant amounts to nearly 4 million curies. Since its radioactive half-life is 30.2 years, very little of it decays during a year. The Chernobyl reactor contained a two-year cesium-inventory of about 8 million curies. Recent estimates are that the Chernobyl reactor released about 2.5 million curies of cesium-137, which is equivalent to (2.5 / 4.0) or 62.5 % of a one-year inventory. Now let us consider 100 large nuclear power plants each operating in the USA for a lifespan of about 25 years each. Call “A” the yearly cesium-137 production by one plant. Then 100A = the yearly production by 100 plants. Lifetime production = 25 yrs x 100A/year = 2,500A. 99.9 % containment = release of 1 part per 1,000. With 99.9 % perfect containment, loss = 2.5A. Chernobyl lost 0.625A. The ratio of 2.5A and 0.625A is 4.0. This ratio, 4, has an enormous meaning. It means that achieving 99.9 % perfect containment of the cesium-137 produced by 100 plants during 25 years of operation, through all steps of the cesium’s handling up through final burial, would still result in cesium-137 contamination equivalent in curies to 4 Chernobyl accidents. Worldwide, there are about 400 plants underway, so the same scenario (99.9 % perfection in containing cesium) would mean cesium-loss equivalent to 16 Chernobyl accidents per 25 years of operation. And this assault on human health could occur without blowing the roof off any single plant. The stakes in the correct evaluation of cancer-risk from low-dose exposure extend far beyond one spectacular accident like Chernobyl. Not only do such evaluations affect hundreds of millions of medical and dental patients, and millions of occupationally exposed workers, but correct evaluation necessarily affects the decisions which will determine the ultimate and aggregate levels of radioactive pollution, everywhere, from current and contemplated nuclear activities worldwide. It is possible that new evidence developing in the future will show that our estimates in this book, of cancer-risk from low-dose, low-LET ionizing radiation, are too high—and it is equally possible that new evidence will show that our estimates are too low. In other words, there is as much chance that sampling variation and forecasting are producing underestimates of hazard as overestimates. Pending future evidence, it is scientifically appropriate to produce and disseminate the best risk-estimates which come from the available human epidemiological evidence of good quality. But we will repeat a warning. What is scientifically appropriate behavior is only semi-prudent with regard to public health protection. True prudence with respect to human health would require the operating assumption that current uncertainties in sampling and forecasting are causing us to underestimate the real risk. The following, from “A Wake-Up Call for Everyone Who Dislikes Cancer and Inherited Afflictions,” was published by CNR in 1997. Its continued relevance concerning the dangers from further increases of low dose radiation exposure by official rulings is of concern to all. Raising levels of “permissible” radiation exposure limits, as are now occurring in the U.S. and Japan, is an indicator of how desparate the nuclear industry is to justify further radiological contamination of the biosphere. In this morality play, “the economy” once more trumps health and well-being of all living systems on Earth. We and others have refuted the [above denial group]’s false claims in detail, elsewhere (for example, Gofman 1990, Baverstock 1991, Ward 1991, UNSCEAR 1993, NRPB 1995, Gofman 1996, Pierce 1996—see Reference List). And the work which refutes the claims of the radiation enthusiasts, has not been refuted by them. They just don’t mention it. The fact, so seldom explained by radiation enthusiasts and so often stressed in our publications, is that extra exposure of a population to low-dose radiation creates only a small risk per individual, but it creates a real rate (not a “maybe”) of fatal radiation-induced cancer for the population. For example: In 1990, the government-sponsored BEIR Report (p.172) estimated that if the population received an extra 100 milli-rems of dose every year (approximately equivalent to doubling the natural “background” rate), the dose-increment would induce extra cancer fatality in one out of every 400 people per lifetime (details available in Gofman 1995, Pt.3). Per newborn individual, the extra lifetime risk would be 1 chance in 400—perhaps a “negligible” personal risk in some people’s opinion. The same estimate translates into a lifetime rate of 650,000 extra fatal radiation-induced cancers for a population of 260 million persons (USA). Our own 1990 estimate (Gofman 1990, Table 16-C) is about 7.6 times higher: 4,940,000 extra fatal cancers—1 person in every 53. In our own view, it is quite possible that a permanent doubling of the “background” dose of ionizing radiation, worldwide, would very gradually double mankind’s burden of inherited afflictions—from mental handicaps to predispositions to emotional disorders, cardio-vascular diseases, cancers, immune-system disorders, and so forth. Such a doubling would be the greatest imaginable crime against humanity. In a 1973 radio interview, Dr. Gofman explained in general terms, the scenario of what the world witnessed with the hydrogen explosions and subsequent triple-meltdowns at Fukushima beginning on March 11, 2011. As all six reactors had come online by 1979 and had been operating for three-plus decades, one can only imagine how much radioactive inventory at a minimum was resident—in the spent fuel pools as well as the reactor cores—when the three reactors overheated and went critical. As described below, within a year or less for a new power plant that started up in the 1970s, it would have had within it, a repository of radioactivity equivalent to a thousand Hiroshima Bombs. But what you must understand is that a nuclear plant that’s been operating—one of the large ones that’s being built now—that’s been operating, say, for between three months and a year, has within it, a repository of radioactivity equivalent to that of approximately a thousand Hiroshima bombs, the radioactivity of a thousand Hiroshima bombs. Now very often the utilities industry in endeavoring to mis-state the position of the critics—that the critics say the nuclear power plant’s going to explode like an atomic bomb. That isn’t so at all. The nuclear power plant won’t explode like an atom bomb. But, unfortunately, it doesn’t have to. If a nuclear power plant should lose its cooling water, through the action say, of a saboteur, an airplane crashing into the cooling water, or failure of the cooling system, the nuclear power plant will shut itself down. That sounds as though everything is fine. But that’s where the trouble only begins. Because there is so much contained radioactivity in there that even after the plant shuts itself down the heat generated by that radioactivity will heat up that nuclear power plant at a rate of about 50 degrees per second. So it will very rapidly heat itself up to several thousand degrees and everything in the core of the reactor will melt and it will keep itself hot as a result of the further radioactive decay. The accident that this could cause has been named, semi-facetiously, the China Syndrome. When asked why this is called that, they said because the darned thing could melt itself all the way through to China. Now in truth it won’t melt all the way through to China. It’s estimated that it will cool itself down and probably wouldn’t melt more than a half a mile into the earth. The trouble is along the way there’s water around and molten metal which is generating hydrogen by reacting with water and hydrogen is explosive as you know. So you have the probability of a chemical explosion of the hydrogen and the steam, spewing radioactivity out of this plant. Remember: the inventory at full operation is something of the order of a thousand Hiroshima bombs-worth of radioactivity. That’s such an astronomical amount of radioactivity that it’s really just hard to contemplate what the numbers mean. But I might put it this way. Now that we’re going ahead building these nuclear power plants, 10 to 30 miles from major metropolitan centers like New York, Philadelphia, Chicago, and we will in time build them close to Los Angeles, we now have a situation, if one of these accidents occurs and the wind is blowing in the right direction we can blanket a major city like New York, Philadelphia, and Chicago—any one of them—with radiation such that if the people stay there, for 12 hours or more, they’re going to accumulate a dose of radiation in the neighborhood of several hundred of the radiation units we call the RAD. That means that what you do in the event of such a nuclear power plant failure is you must organize the evacuation say of a city like Philadelphia or New York and get the people out within say 6 to 10 hours because you can’t afford to have them stay there 12 to 24 hours and get this fatal dose. It’s an interesting thing to contemplate how you’d get everybody off the island of Manhattan at a given point when there might be say 6 to 8 million people there and get them all out—these refugees from radioactivity—inside of a few hours. That’s in the short term. Then even for those who get lower doses, perhaps they haven’t been right in the cloud of a such a disaster; if they get lower doses they may not show any injury acutely in days, weeks, or months. As a matter of fact if you ask them how they feel they’ll say, I feel fine. And they do. But what they have now built into them is a new risk. Because for every RAD that they accumulate of radiation, they’ve engendered for themselves a two percent increase in the chance of developing cancer between 5 and 30 years later. So if you take a group of people, for example, who don’t get enough radiation to die of acute radiation sickness, say they get 50 RADs. They’re going to have 50 times 2 or 100 percent increase in their cancer occurrence rate between 5 and 30 years later. So that in this group of people for every person who would die of cancer ordinarily, two will die of cancer or leukemia. The other thing that you do is approximately at the same rate, about a two percent increase per RAD, you increase genetic mutations. So the offspring of these people for generations will suffer from the genetic diseases that can be caused by mutations. So the cancer and genetic hazard are the prominent, important late effects, the acute radiation sickness the early effect. None of this occurs if everything goes perfectly. And what the nuclear power people would have us believe is that all acts of God will be avoided, no humans will ever make errors because they’re infallible, all machinery will work perfectly under all circumstances and there will be no failures of equipment whatsoever, no airplanes will stray and crash, and there will be no psychotics or saboteurs and no conventional, guerrilla, or military activity. Dr. Gofman’s 1980 description to Leslie Freeman regarding the consequences of sanctioning nuclear power go to the heart of this technology and its use for the purpose of making electricity. Gofman has acknowledged in many statements, his own culpability, along with “a lot of the atomic energy scientists in the late fifties” of being candidates for Nuremberg trials for the crime of experimentation without prior consent, as well as irrevocably damaging the gene pool of future generations. As of yet I am unaware of others admitting their own connivance in their past promotion of atomic energy. In terms of being complicit, Dr. Gofman did more in his life to warn people of the dangers of radiation than most other scientists. Licensing a nuclear power plant is in my view, licensing random premeditated murder. First of all, when you license a plant, you know what you’re doing—so it’s premeditated. You can’t say, “I didn’t know.” Second, the evidence on radiation-producing cancer is beyond doubt. [As of 1980] I’ve worked fifteen years on it, and so have many others. It is not a question any more: radiation produces cancer, and the evidence is good all the way down to the lowest doses. The only way you could license nuclear power plants and not have murder is if you could guarantee perfect containment. But they admit that they’re not going to contain it perfectly. They allow workers to get irradiated, and they have an allowable dose for the population. [28nw] So in essence I can figure out from their allowable amounts how many they are willing to kill per year. I view this as a disgrace, as a public health disgrace. The idea of anyone saying that it’s all right to murder so many in exchange for profits from electricity—or what they call “benefits” from electricity—the idea that it’s all right to do that is a new advance in depravity, particularly since it will affect future generations. You must decide what your views are on this: is it all right to murder people knowingly? If so, why do you worry about homicide? But if you say, “The number won’t be too large. We might only kill fifty thousand—and that’s like automobiles”—is that all right? People like myself and a lot of the atomic energy scientists in the late fifties deserve Nuremberg trials. At Nuremberg we said those who participate in human experimentation are committing a crime. Scientists like myself who said in 1957, “Maybe Linus Pauling is right about radiation causing cancer, but we don’t really know, and therefore we shouldn’t stop progress,” were saying in essence that it’s all right to experiment. Since we don’t know, let’s go ahead. So we were experimenting on humans, weren’t we? But once you know that your nuclear power plants are going to release radioactivity and kill a certain number of people, you are no longer committing the crime of experimentation—you are committing a higher crime. Scientists who support these nuclear plants—knowing the effects of radiation—don’t deserve trials for experimentation; they deserve trials for murder. In 1978, Dr. Gofman prepared a statement for the Cactus Alliance in opposition to the Palo Verde nuclear power plant in Arizona. His candor in accepting personal responsibility for failure to sound an alarm over atmospheric bomb testing and nuclear power many years sooner than he did is of supreme significance. His efforts to compensate for this lack of understanding—once the sky did fall in on him and Dr. Tamplin from the AEC and the nuclear power and electric utility industries beginning in late 1969—reveal a profoundly more adaptable and engaged intelligence and curiosity than perhaps he knew he possessed before then. It is said that nuclear power plants can operate legally simply because they are licensed to operate by the Nuclear Regulatory Commission. The Nuclear Regulatory Commission is operating legally because Congress legislated it into existence to issue such licenses. But what has all this to do with justice and natural rights? Congress has no authority under the Constitution to issue murder licenses. Moreover, Congress could have no such authority, simply because one of the rights protected by the Ninth Amendment is the natural right to justice and to life. That is my opinion, and it would not be altered one whit if there were 100 decisions by the Supreme Court which stated that it is permissible to murder people. There is a higher law. It amazes me that people don’t seem to realize the implications of permitting laws to be passed which violate justice and natural rights. It amazes me especially since it is so soon after the Nazi Holocaust and the Nuremberg Trials. In Nazi Germany the rulers, as evil people as one can imagine, wished to carry out a program of genocide. Because of the recognition that people might object to such a gross violation of justice and human rights, even the Nazis decided to make the process legal, at least in part, by passing laws which permitted judges to send people to their death with no justification at all other than a Nazi-passed law. At the Nuremberg Trials, the United States declared that this sham of using “laws” to subvert justice was a heinous crime, and we meted out severe sentences to judges who had used the Nazi “laws” as a shield for the crimes which they (the judges) committed on the bench. If the Congress of the United States can permit the Nuclear Regulatory Commission to deprive people of life without due process of law, and if the Supreme Court turns its head from realizing this, as it did in declaring the Price-Anderson Act to be Constitutional, where are the guarantees that far worse injustices and violations of human rights will not be carried through in the future? In the USA, we have already accepted the policy of experimentation on involuntary human subjects. Every year, we introduce new chemical compounds of uncertain toxicity into the workplace and the biosphere. In the mid-fifties—when the toxicity of low-dose radiation was still uncertain—we were testing nuclear bombs in the atmosphere and launching the Atoms for Peace program. It should have been clear to me, even then, that both atmospheric bomb-testing and nuclear power constituted experimentation on involuntary human subjects, indeed on all forms of life. Instead, I am on record in 1957 as not being worried yet about fallout, and still being optimistic about the benefits of nuclear power. There is no way I can justify my failure to help sound an alarm over these activities many years sooner than I did. I feel that at least several hundred scientists trained in the biomedical aspect of atomic energy—myself definitely included—are candidates for Nuremberg-type trails for crimes against humanity through our gross negligence and irresponsibility. I began working with Dr. John Gofman and Egan O’Connor in 1995 to create hypertext copy of a subset of his articles and his books. The experience has been one of the high-water marks in this life. As the work proceeded and more copy became digitally available, I was especially struck by how gratified and appreciative Dr. Gofman was in seeing his research, writings, and conclusions gain a wider exposure through the internet—to anyone anywhere on Earth who had access to a computer—than he had imagined possible before that time. Dr. Gofman became more and more focused on the consequences of “average per patient radiation doses from diagnostic and interventional radiology [and how they can] be reduced by a great deal, without reducing the medical benefits of the procedures in any way. The same procedures can be done at substantially lower dose-levels.” Implementing standardized, measurable lowered dose levels provides an immense benefit for reducing the chances of cancer induction for millions of people without interfering with a single diagnostic exam. Ms. O’Connor again shared her insights regarding the biggest hurdle to overcome amongst members of the medical community. When others do not accept Gofman’s estimates about medical radiation, it is mostly from their ignorance about the widely acknowledged higher potency of medical x-rays compared with A-bomb gammas, and their ignorance about the kind of doses that were accumulated in the past from medical x-rays. Again and again we hear, “75% cannot be true because we all receive higher doses from natural background radiation than from medical x-rays.” They are just plain and seriously and severely wrong about that. The average whole-body accumulated dose grew to many times the natural background dose (Gofman 1999, Appendix K). Acceptance of Gofman’s estimates about Chernobyl and medical x-rays would be far greater if the skeptics would just read what he produced. But physicians certainly don’t want him to be correct. They would not like to think how many deaths and miseries have resulted from their ignorance. And the nuclear establishment does not want him to be correct, because it dreadfully interferes with their hopes, past and reviving, for plutonium economies here and abroad. Dr. John Gofman was a pioneering medical physicist. Beginning in 1969 he became a highly effective and constructive critic of nuclear energy and medical radiation practices. His analysis was based upon his comprehensive understanding of the biological effects of radiation exposure. His conclusion—supported by many written works detailing his research step-by-step—that there is no risk-free dose of exposure to ionizing radiation, has never been refuted by the medical or nuclear industries. The response is to ignore his work. And then there is the rest of humanity. To learn about and share this written legacy, to educate ourselves and others, serves Life’s needs here on Earth and gives significance and purpose to our days. CNR Book Division, 1999, pp.19-20. #3,123,535 Glenn T. Seaborg, John W. Gofman, Raymond W. Stoughton: The slow and fast neutron fissionability of uranium-233, with its application to production of nuclear power or nuclear weapons. #2,671,251 John W. Gofman, Robert E. Connick, Arthur C. Wahl: The sodium uranyl acetate process for the separation of plutonium in irradiated fuel from uranium and fission products. #2,912,302 Robert E. Connick, John W. Gofman, George C. Pimentel: The columbium oxide process for the separation of plutonium in irradiated fuel from uranium and fission products. 1946 Gold-Headed Cane Award, Presented to Graduating Senior in Medicine, University of California Medical School, for personifying qualities of a true physician. 1954 Modern Medicine Award, for outstanding contributions to heart disease research. 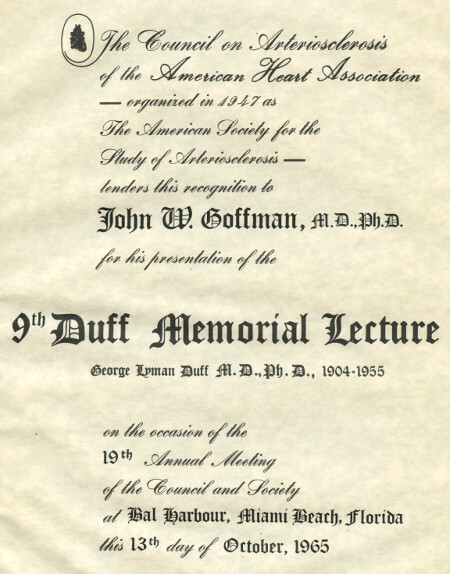 1965 The Lyman Duff Lectureship Award of the American Heart Association for research in atherosclerosis and coronary heart disease. 1972 The Stouffer Prize, shared $50,000 prize and Gold Medal for outstanding contributions to research in arteriosclerosis. 1974 American College of Cardiology, Selection as one of 25 leading cardiology researchers of the past quarter-century. 1992 Right Livelihood Award, "for pioneering work in exposing the health effects of low-level radiation" and "for vision and work forming an essential contribution to making life more whole, healing our planet, and uplifting humanity." Lipoproteins, Atherosclerosis, and Coronary Heart Disease. Ultracentrifugal Discovery and Analysis of the Serum Lipoproteins. Characterization of Familial Lipoprotein Disorders. The Determination of Trace Elements by X-ray Spectrochemical Analysis. The Relationship of Human Chromosomes to Cancer. The Lung Cancer Hazard of Plutonium. Problems Associated with Nuclear Power Production. The Biological and Medical Effects of Ionizing Radiation, With Particular Reference to Cancer, Leukemia and Genetic Diseases From Radionuclides and X-ray Sources. by Leslie Freeman, W.W. Norton, 1981, p.106. John W. Gofman, Medical Physicist. “Plutonium-241 from Fukushima nearly 70,000 times more than atomic bomb fallout in Japan – Gov’t Labs: Large areas of oceans contaminated by plutonium from events such as Fukushima; Build-up in biosphere expected; Considerable hazard to humans – Officials: Molten fuel now ‘particle-like’, contains ‘special’ nuclear materials,” Energy News, 03/25/15. 1979 Pacifica Radio interview with KPFA news producer Aileen Alfandary. Excerpt from recording reproduced in Maria Gilardin, “Shut Down Nuclear Power Plants; The Life and Work of Dr. John Gofman, Part One,” TUC Radio, May 22, 2012. Curriculum Vitae of Dr. John W. Gofman, M.D., Ph.D., from Preventing Breast Cancer: The Story of a Major, Proven, Preventable Cause of this Disease, by John W. Gofman, M.D., Ph.D., Committee for Nuclear Responsibility, 2nd Edition, 1996, p.379. John W. Gofman, Oliver DeLalla and Frank Glazier, Norman K. Freeman, Frank T. Lindgren, Alex V. Nichols, Beverly Strisower, Arthur R. Tamplin, “The Serum Lipoprotein Transport System in Health, Metabolic Disorders, Atherosclerosis and Coronary Heart Disease,” Plasma 2, 1954, No.4: 413-484. This paper was re-typeset and fully re-published in May 2007 by the Journal of Clinical Lipidology, 1 No.2: 104-141. Nuclear Witnesses, op. cit., p.90. Dr. Harold Knapp, in Anne Fadiman, “The Downwind People: A Thousand Americans Sue for Damage Brought on by Atomic Fallout,” Life, June 1980, p. 39. Cited in Nuclear Witnesses, fn.11, p. 90. Gofman and Tamplin Ostracized, 1994 Oral Histories: Dr. John Gofman, op. cit. I am grateful to Ms. Egan O’Connor for this description of the many invited talks Dr. Gofman gave and the evolution of his thinking from October 1969 to August 1970. 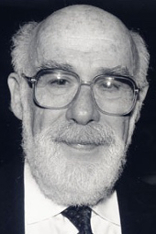 Ms. O’Connor was Dr. Gofman’s editor and assistant from 1970 until his death in 2007. We had tried to move all of our work to the [UC Berkeley] Boalt School of Law in 1970, to set up a center in the School of Law for the adversary study of science, to provide the other side of the picture on a number of issues of great public concern. The faculty of the School of Law voted unanimously to embrace this project. I went back and saw the Ford Foundation and they said they would probably support it. [Richard M.] Busbaum, the head of the project at Boalt, backed it. And then Ford just dragged their feet and dragged their feet. John W. Gofman M.D., Radiation and Human Health (San Francisco: Sierra Club Books, 1981). [M]edical radiation, from x-ray machines, is roughly twice as harmful per unit dose as Hiroshima-Nagasaki radiation [because of] the effect of linear energy transfer. When gamma rays or x-rays set electrons in motion, the electrons are traveling at a lower speed than the electrons coming out of Cesium-137. And as a result, when they’re traveling at a lower speed, they interact much more with each micrometer of path they travel. Therefore the local harm is much greater. So medical x-rays set in motion electrons that are traveling at a lower speed and hence producing about twice the linear energy transfer, and hence twice the biological effect. That’s why alpha particles from radium or plutonium are so much more devastating than beta rays set in motion from x-rays. The alpha particles, with their heavy mass and plus-2 charge, just rip through tissue so strenuously that they don’t go very far. A deception of the crassest sort are the lectures by pro-nuclear people showing a plutonium or radium source and putting up a piece of paper and showing that the alpha-particle radiation on the other side is zero. “You see, a piece of paper will stop those alpha particles, folks, there’s no problem with plutonium.” Except when that alpha particle is lodged next to an endosteal cell in the bone and producing a horrendous amount of interaction. Or that alpha particle is lodging on the surface of the bronchi — that’s why we’ve got an epidemic of lung cancer among the uranium miners! The fact that they don’t travel far is because they interact like hell! “White House Approves Radical Radiation Cleanup Rollback, Civilian Cancer Deaths Expected to Skyrocket Following Radiological Incidents,” Public Employees for Environmental Responsibility (PEER), April 8, 2013. “Japan: Government to Raise Maximum Annual Radiation Exposure Ahead of Restart of Nuclear Reactors, Mainichi Shimbum, June 30, 2015.